fresh basil, fresh mozzarella, fresh tomato, bit of balsamic vinegar between fresh homemade challah bread slices, brushed w/ olive oil, toasted on the panini grill. layers of thin sliced peeled apple & a good cheddar, in a pita pocket, toasted in a skillet or on the panini grill. I make this one with ciabatta bread and cook the sandwich in a big frying pan and put garlic powder and parmesan cheese in the oil. I cook the whole loaf and then slice it. I can’t make it too often because I could eat this whole thing by myself!!! I meant I make the Caprese panini in case you were wondering which sandwich I was talking about. My sandwich isn’t all that unique as I know many have probably made it before, but it’s my very favorite, especially in the summertime! It tastes even better if you garden (like we do) and can grab your produce right outside of your door! Brush each side of the french bread lightly with extra virgin olive oil. Sprinkle with minced garlic, sea salt, and pepper to taste. Toast in the oven until light golden brown (I usually throw it in and turn on the broiler – just watch because it goes fast). Remove from oven and build your sandwich with lettuce mixture, basil, tomato slices, and mozzarella. Enjoy!! My favorite sandwich? Genoa salami, provolone, yellow mustard and Italian bread. Preheat a panini press. Assemble the sandwiches by layering even amounts of the following in order: 2-3 slices of ham folded over, one slice of swiss cheese, 2-3 slices of pork, pickles, and another slice of cheese. Spread a very thin layer of dijon mustard on the roll and top. Place on the panini maker and press the lid to flatten. Lock the lid in place and cook until the cheese begins to melt, approximately 5 to 6 minutes. Toast the bread, spread on the mustard, add a few thin slices of cheese, and then pile on the pickles! Combine all of the ingredients and stir well. Refrigerate for at least one day, stirring occasionally. Although the liquid won’t completely cover the cukes and onions at first, they’ll eventually soften and take up less space. Pickles will keep in the fridge for a couple of weeks, and are fantastic on sandwiches, salads, with pita and hummus, or just to munch on. I’m not sure if you have a Jason’s Deli in your area (they’re all over here in Texas), but they used to have this sandwich called the Sargent Pepper. I did a remake here at home and the kids devoured it, my husband loves it, and it’s quick yet good enough for dinner. 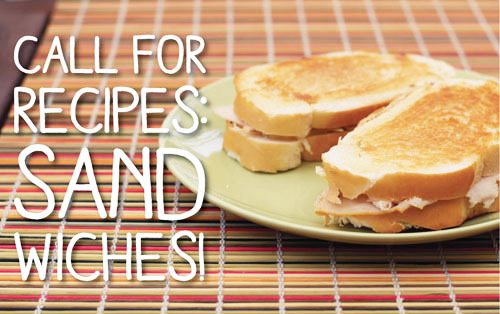 Assemble your sandwich with the cheese on top and broil in the oven until cheese is melty. You will want the bread to be pretty crispy because the juice from the peppers and onions can make the bread soggy. -Tailgater subs- BEST SANDWICH EVER!!!!! Assemble in this order: Turkey, onion, a little bit of stuffing, a little bit of gravy (not too much or the bread gets soggy). Open-faced fried egg toasted english muffin sandwich packed with greens, tomatoes, honey mustard, and salsa. Have you ever had a grilled PB&J? You make a regular pb&j, butter up the outside and grill it, just like a grilled cheese. MMMMM! I like to use homemade freezer jam, both inside, and then heat up a little bit and use it like a syrup on top. It’s like the perfect dessert, but you can still call it lunch! Sandwiches are also my favorite food. I usually want them for Mother’s Day, my birthday, etc. Add some ruffles or french fries and I am in heaven. 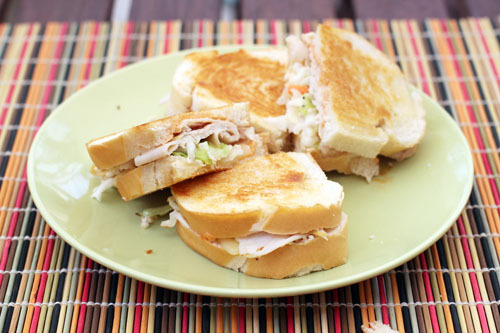 Our faves, turkey, provolone, pesto panini cooked in olive oil. Two pieces of provolone with a piece of turkey in the middle, put pesto on both sides of the bread. My favorite wrap? Whole wheat tortilla, spread one triangle of soft laughing cow, top with capers, roasted red peppers, onion, slice of turkey, fill with spinach or lettuce and wrap. So delish and low cal. I also like to take a whole wheat tortilla spread with laughing cow, add cooked chicken or lunch meat and some Trader Joe’s red thai curry sauce. Add some romaine lettuce for crunch and filler and wrap up. My favorite sammich for summer is a nice Italian chicken sammich on whole grain bread. Slice up some chicken breasts into thin strips, get a bottle of zesty Italian dressing (low fat doesn’t work so well and tends to burn in the pan)and throw them both into a pan on medium high heat, you want to cover the chicken in dressing completely and then move the chicken around a bit so the oil from the dressing gets under the pieces as well so they don’t stick and burn. Cook until chicken is nice and browned and the little bits of stuff in the dressing is cooked onto the chicken. Wait for it to cool down then cut it into chunks. To assemble the sammich i personally use whole grain bread (the one with the sunflower seeds baked in)that has been toasted. Then i smear both sides with ranch dressing before putting green leaf lettuce, sliced tomato (with the gunk removed from the middle) and sliced radishes. We love all of the ‘salad’ sandwiches. Chicken, tuna, egg, shrimp & on & on. What makes it great for us are the ‘adds.’ I leave out lettuce, tomato slices, sprouts, pepperoncini, different cheeses and a couple of bread choices. I have a few current favorites. Pesto chicken salad. Pesto, mayo, chicken, topped with lettuce, tomato, and a dash of balsamic. Or the apple cheddar one from moo zoo cooks. JalapeÃ±o bread, apples, cheddar, Dijon cider vinegar dressing. Yum. Not very fancy, but we love New England style Italians. There’s variation in how folks make it of course and I guess it’s just called a hoagie(?) elsewhere. We use a soft sub style roll and layer on ham or salami with American cheese and thinly sliced veg: onion, lettuce, pickle, tomato, green pepper. I like banana pepper rings and olives too, and often omit the ham. Some just pour a little evoo over, but we like a smear of mayo on the bread and hubs loves Italian dressing and or hot pepper relish on it. Cold and refreshing. Love this post. I switched doctors/hospitals for this current pregnancy, and one of the first things my new OB said was, “I don’t know if you’re a sandwich person, but in my book, you can throw the ‘no lunchmeat’ rule out the window …” I knew at that moment I had picked the perfect doctor for myself. Giving up sandwiches was the worst part of my first pregnancy! My favorite is roast turkey on Dave’s Killer 21-grain bread, with cream cheese sprinkled with sunflower seeds, and topped with avocado, tomato, and lettuce. Mmmm. Maybe I’ll go make one right now! My husband loves this Buffalo Chicken Sandwich, and my father-in-law actually requested it the week after my mother-in-law passed away as the “only thing” he wanted to eat. I LOVE Cuban sandwiches (Jared P.’s recipe, but not pressed and with bread & butter pickles instead of dill) but my current fave is the Fig & Pig from sweetsugarbean: grilled brie, bacon & fig jam on a sturdy nut bread. YUM! Mmmmm, looks delicious!!!!!!!!!!!!!!! I just tried my first Rachel Sandwich yesterday and it was great! America’s Test Kitchen noted it as a variation of their Reuben Sandwich. I think ours were piled twice as high with meat as yours though – lol. Thanks for posting! We toast them in the toaster oven, but you can bake them on a baking sheet, or lightly toast the bagel first and then broil them to melt the cheese. never too late! thank you!!! My favorite sandwich is one I invented as a teenager. I take a crusty sandwich roll, split and toasted, and spread a little cream cheese on it then add on hot grilled or sauteed chicken breast, sliced up, and a heaping helping of caramelized onions. A grind or two of black pepper et voila! Bagel (toasted), cream cheese, sliced hard boiled egg, salt and pepper – I eat these open faced. Yum! Peanut butter and lettuce. This is best with a crisp low flavor lettuce like iceberg. Romain is ok but the softer green leafs are not so good.